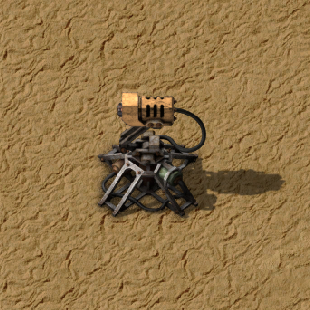 Laser turrets are an advanced defense building with a longer range, infinite ammo, good damage and use electricity to operate (and a smaller amount of energy when idle). By dealing laser damage, they don't face any resistances (enemies receive full damage) but have a lower rate of fire than gun turrets. Each shot costs 800kJ of energy; as the shooting speed increases through upgrades, so too does the power required to keep firing. Using laser turrets to ward off attacks can cause electricity usage spikes, these can be offset by using accumulators (or steam storage and excess steam turbines). Win the game without building any laser turrets. Laser turret now use new laser beams. Laser turret projectiles move much faster. All turrets now have a 2x2 footprint. Made 4x as powerful and expensive. Can now be researched in the New hope Campaign level 4. Decreased resting energy consumption of laser turret to 1/3 of original value. A gif of the laser turret rotating. This page was last edited on 22 March 2019, at 07:13.